Good afternoon ladies and gentlemen, friends and relatives, and most importantly, Class of 2014. We are all sharing “firsts” today. This is my first White Coat Ceremony, too. This is a special day for you, because you join the ranks of the profession you are studying to join. It is a profession that is centuries old and you will follow the traditions your predecessors developed, and you will in turn be part of the continuing change in its practices. My guess is that, when you retire, you will be helping people in ways that we cant even imagine today. UH Hilo began as a small branch campus of the UH in Mānoa. 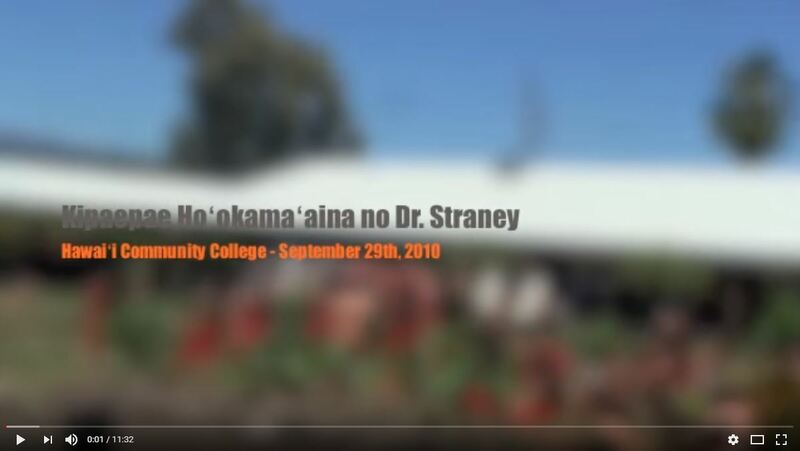 Its mission was to prepare Hilo students to transfer to receive their degrees on O‘ahu. UH Hilo is no longer a branch campus—it is a university in its own right. UH Hilo has grown to be a university of national stature with an international scope. The island of Hawai‘i is the best place in the world to study a surprisingly long list of subjects: astronomy, marine biology, evolution, natural products, rural sociology, and so forth. Because this is such a perfect place for scholars to work, UH Hilo has attracted some of the best faculty in these fields. They bring to the Hilo community not just a way to begin a college education—they bring to Hilo one of the best college educations you can find anywhere in the country. UH Hilo gives students an opportunity to learn from the very best what matters most to this island to the state and to the world. The College of Pharmacy is an excellent model of what UH Hilo can do. Four years ago, you could not have studied pharmacy on the island of Hawaii. Today, not only can you study it here, but you work with faculty recruited from across the world for their skills and abilities as scientists. They will teach you as well or better than at any other school in the country. One reason I believe the education you will receive here is so good is that the college is committed to preparing you to take what you learn here and use it to make your communities better. The faculty of the college are nationally recognized for that commitment, most recently with the award of a $16 M grant to establish an integrated health information system on the island. The College of Pharmacy serves as the nucleus for building a center of excellence in health care, delivery and development at UH Hilo. As we build our program in health care, we will focus our attention on the needs of communities like those found on the island of Hawaii—rural, dispersed communities where access to health care is a critical social challenge. Today, I am pleased to formalize this UH Hilo health care initiative and to announce the formation of the Center for Rural Health Science at UH Hilo. It will be housed in the College of Pharmacy and draw together physicians, pharmacists, nurses and other health care providers to solve rural health problems in Hawai‘i and throughout the Pacific by means of research, education, community service and policy change. The founding director will be Dr. Karen Pellegrin, director of strategic planning and continuing education in the College of Pharmacy, and principal investigator of the $16 million federal Beacon Community grant. I want to thank her for agreeing to serve in this capacity. The Center for Rural Health Science is an extraordinary opportunity for UH Hilo to help improve life in the rural communities of Hawai‘i through new and better models of health care. It will have the resources, the expertise and the partners to succeed. Our College of Pharmacy collaborates effectively with hospitals and health care providers all over the state, and UH Hilo’s School of Nursing has enthusiastically embraced the opportunity to support the center’s work. The center will be an important means for UH Hilo to contribute to improving the health status of our region. Dean Pezzuto, and the extraordinary faculty he has assembled, are helping UH Hilo contribute to our community in ways we didn’t imagine a few years ago. Even beyond the new center, the College of Pharmacy is planning new programs, such as physical therapy, as well as dual degree options. A new building is being planned that we hope will lead to a larger health care center. Pharmacy will be the anchor for these initiatives. You can take pride in the fact that, as the fourth class to be seated, you represent the maturation of the College. You and the three classes before you comprise the foundation that will support the college’s future. So congratulations to you, Class of 2014, on being admitted to such a dynamic program. The faculty have every confidence that you will succeed in your studies. I know you will continue to make your family proud, to make the faculty proud, and to make the community proud, as you continue your journey. See you at graduation! As an institution of higher education, the University of Hawai‘i at Hilo plays a critical role in shaping the quality of life in the communities we serve. With the maturation of the College of Pharmacy, UH Hilo is ready to take a leadership role in addressing health care issues in the state. Rural communities all over America suffer shortages of physicians, pharmacists and other clinicians, and rural hospitals struggle to stay afloat. These challenges are more complex in the remote islands of Hawai‘i, some 2,400 miles from the nearest continent. It’s clear that improved access to high quality health care for our rural citizens is not going to happen on its own. We need coordinated action to maximize the effectiveness of existing resources. To this end, UH Hilo has established the Center for Rural Health Science, which will be housed in the College of Pharmacy. The center will draw together a wide range of health care providers to solve rural health problems through research, education, community service, and policy change. Our College of Pharmacy has the capacity to lead such a major initiative, and our School of Nursing embraces the opportunity to support the center’s work. The center’s founding director will be Dr. Karen Pellegrin, the College of Pharmacy’s director of strategic planning and continuing education. She is also the principal investigator of the $16 million federal Beacon Community grant, which serves as the cornerstone for the center’s work. Incorporated as a non-profit, the Hawai‘i Island Beacon Community recently hired its core management team. The president and chairman of the board is Dr. Ed Montell, a gastroenterologist who has practiced on the Big Island for 30 years and served in numerous leadership positions for health care organizations. Dr. Montell’s leadership has been critical in bringing the community together to pursue the Beacon Community’s goals: to improve access to primary care, specialty care, and behavioral health care; to avert the onset and improve management of chronic disease; and to reduce health disparities among Native Hawaiians and other populations at risk. 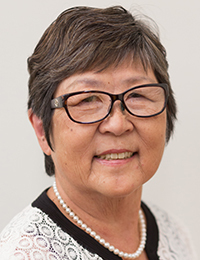 The new center will also be the home of a grant from the US Department of Agriculture to improve medication safety for rural Hawaii’s older adults. Dr. Anna Barbato, assistant professor of pharmacy practice in the UH Hilo College of Pharmacy and a certified geriatric specialist pharmacist, took the lead in developing community educational programs. To date, the College of Pharmacy has delivered medication safety programs to over 500 seniors in rural areas, including the Big Island, Maui, Lāna‘i, and Kaua‘i. Additional public seminars are being planned. The USDA grant also provides funds for continuing education for physicians, pharmacists, and nurses to help them improve medication safety in the older adults they treat. Dr. Scott Holuby, affiliate faculty member in the College of Pharmacy, has taken the lead in developing this program, which has been delivered via webinar to over 20 clinicians to date. The convenience of attending via webinar has been a key factor for clinicians in rural areas, where opportunities for live continuing education are rare. Additional sessions will be held to reach our goal of over 100 clinicians attending from rural areas throughout Hawai‘i. These are examples of ways the Center for Rural Health Science will bring together health care resources on the island. Ultimately, the center seeks to produce measurable improvements in the quality of health care, its cost effectiveness, and the overall health of Hawaii’s rural communities. The center is an important means for UH Hilo to contribute to quality of life in the islands that sustain us all. In tough economic times, publicly funded universities like the University of Hawai‘i at Hilo must be especially responsive to community needs for educational opportunities and economic development. Consequently, since becoming chancellor last July, I’ve been asking members of the public for their thoughts about how UH Hilo could enhance the well being of our island. The comments I’ve received include encouragement to expand student housing, educate students for jobs needed in the community, develop a “college town” environment around the university, keep the public engaged in decisions affecting Mauna Kea, and expand access to the west side of our island. It’s clear that the public expects UH Hilo to continue evolving, improving and extending its reach throughout the island in order to deliver a solid return on investment into the future. To ensure that we do, I’m taking this first year of my chancellorship to engage the energies of the university in strategic planning. In this process, UH Hilo will take stock of our current situation and commit to our vision of what our university could become and accomplish in the next five years. We will make sure our mission statement clearly conveys the unique benefits UH Hilo offers to students and the community. The plan itself, which should be complete by May 2011, will contain clear goals and the actions we will take to realize those goals. In this way, strategic planning will help UH Hilo focus its tremendous funds of energy and creativity on an affirmed mission and a widely accepted set of goals. Moreover, UH President MRC Greenwood has challenged us to increase the number of our graduates by 25 percent over the next few years, and UH Hilo is expected to meet additional performance benchmarks set by the UH system. We want to hear the thoughts and opinions that Chamber members have about UH Hilo. We would particularly value your feedback on what you think we currently do well, where you think we need to improve, and what our major priorities should be for the next five to ten years. You can provide input by emailing uhhplan@hawaii.edu, or by writing to Siân Millard, Strategic Planning Coordinator, University of Hawai‘i at Hilo, Hilo, HI 96720-4091. Work on developing the strategic plan begins this fall. This invitation for input won’t be a one-time request. We will ensure that community groups have the opportunity to comment on the draft plan once it’s available. University strategic plans are dynamic documents that respond to changing conditions, and as such they are frequently adjusted. Universities engage in more or less continuous planning and implementation of plans. We also monitor results, which are used to inform the next round of planning. I hope we can count on Chamber members to continue to give us their views and insights as UH Hilo plans for positive change into the future. Kipaepae jointly hosted by Hawai‘i Community College and UH Hilo to welcome Chancellor Straney to the community Sept. 29, 2010.